Roommates. Can’t live with them, can’t afford to live without them. Opposites attract as breathtaking acrobatics and slapstick comedy merge in an homage to roommates everywhere. Two young women stuck in one tiny apartment navigate the trials and tribulations of female friendship. Will they lift each other up (pun intended) or get stuck in a bind by their own terms and conditions?! 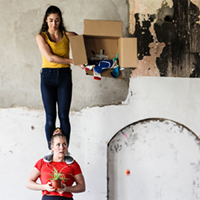 Two people who are unexpectedly thrown together as roommates must learn to live together in a small apartment in this comedy featuring the acrobatic duo of Cynthia Price and Taylor Casas (who also appear in Flight). Their acrobatic abilities add a different dimension that isn’t usually seen in a comedy like this, and it really takes the slap-stick up a notch. It also makes the various battles that ensue really amazing as they flip and balance and spin around each other. Very well done! I appreciated that they let the audience know before the show that in a few movements where they will be doing taller balancing that they would be done in specific spots in the otherwise low ceiling venue. You want funny? You want amazing? You want roommates who can’t get along?! We’ve got you covered! Terms & Conditions is our acrobatic take on The Odd Couple! With high-flying acro, silly prat falls, and passive aggressive double takes, T&C is your remedy for… well, we’re not quite sure. But people tell us they have a good time. Winner 2018 San Diego Fringe Outstanding Physical Arts Award! Lots of critics say we’re impressive, come see for yourself. Bring a roomie.